Recently, deep learning has become one of the core technologies of computer vision and artificial intelligence. Deep learning is a data-driven technology and its performance heavily relies on large-scale labeled data, e.g., ImageNet and MS COCO. Unfortunately, it is rather expensive to collect and annotate large-scale image data from the real world, the collected real images are limited in covering complex environmental conditions, and the real scenes are uncontrollable and unrepeatable. As a result, the performance of current deep learning systems is not satisfactory while working in complex scenarios, such as autonomous driving and intelligent monitoring scenarios. 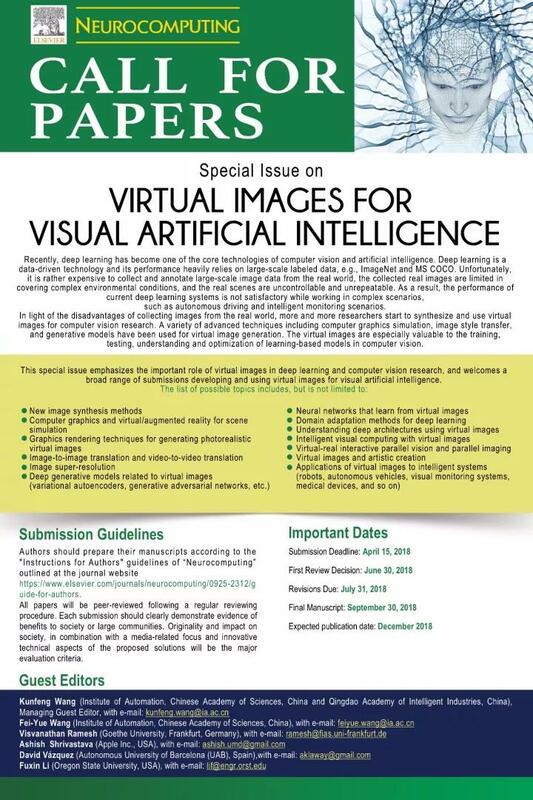 In light of the disadvantages of collecting images from the real world, more and more researchers start to synthesize and use virtual images for computer vision research. A variety of advanced techniques including computer graphics simulation, image style transfer, and generative models have been used for virtual image generation*. The virtual images are especially valuable to the training, testing, understanding and optimization of learning-based models in computer vision**. All papers will be peer-reviewed following a regular reviewing procedure. Each submission should clearly demonstrate evidence of benefits to society or large communities. Originality and impact on society, in combination with a media-related focus and innovative technical aspects of the proposed solutions will be the major evaluation criteria. * Kunfeng Wang, Chao Gou, and Fei-Yue Wang. Parallel vision: an ACP-based approach to intelligent vision computing. Acta Automatica Sinica, 2016, 42(10): 1490−1500. ** Kunfeng Wang, Chao Gou, Nanning Zheng, James M. Rehg, and Fei-Yue Wang. Parallel vision for perception and understanding of complex scenes: methods, framework, and perspectives. Artificial Intelligence Review, 2017, 48(3): 299−329.